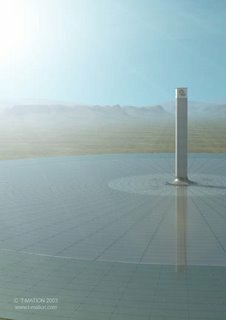 A 25,000 acre sheep farm in the outback of Australia is the siting of the worlds tallest power-generating solar tower which is due to be built by the end of 2009. Like many great inventions, the technology is essentially simple and the execution beautiful. Standing at 1000 meters high, it is surrounded by a skirt of glass, polycarbonate and polymer covering approximately one square kilometer. The air under the collector skirt is heated by the sun up to 70C and funneled up the hollow chimney by convection - thus the hot air rises. As it rises, the air accelerates to 35 mph, driving 32 wind turbines inside the tower, which generate electricity much like conventional wind farms. Each solar tower can produce up to 200 megawatts of electricity. This would abate up to 920,000 tonnes of carbon dioxide emissions annually from fossil fuels, which equates to over 250,000 return flights from London to Australia. It is little wonder the Chinese are interested in purchasing a few. What is in that paint pot?